We also dropped in on Obama and Hillary! I read a headline today that caught my attention, “How Do People Find the Time to Watch Television?” Boy, I ask myself that all the time. I should quickly tell you that this great headline was in a blog I read called TechDirt which is a hot read of you like tech, law and culture. Anyway, back to television. The point of the article was about a shift we are all making from passive media to interactive media. For me, it really is the difference between having content spewed at you and actually finding a way to make it personal and relevant to your life. And as I thought about it, this is what’s been happening around our house. It’s totally cool and I have a very recent example! My eight year old daughter has been very engaged with this year’s election. Like so many of her older peers, she loves Obama and really wants him to win. Her interest in politics has been nourished by the media (we watch Good Morning America during breakfast). We decided to turn it into a trip to Washington DC for spring break. 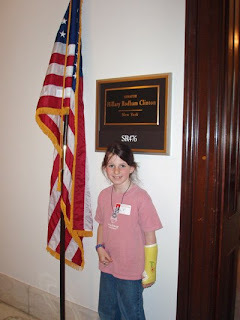 With her growing interest in government and the process, it seemed like a natural fit. In DC, we spent a great deal of time in the Senate buildings – did you know there are three? – and visited Barak Obama and Hillary Clinton’s office. 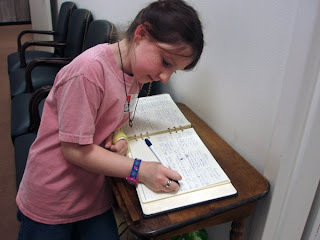 The staff in both offices were very kind and open to having a family drift in and check things out. Katie was truly excited to be that close to the candidates. It made something she has seen on television very real. Signing Barak's book was memorable. Clinton's office is a beautiful butter yellow. Very feminine. We also stopped at the National Portrait Gallery – a place we might have missed if it hadn’t been television – because we had to see a very important portrait. No, not George Washington. Not Thomas Jefferson (have you ever noticed his profile looks remarkably similar to Steve Carell?). No this man focuses on “truthiness.” If you watch Comedy Central you know I am talking about Stephen Colbert. 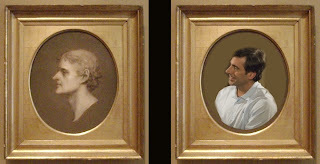 Jefferson and Carell share a profile - can you see it? 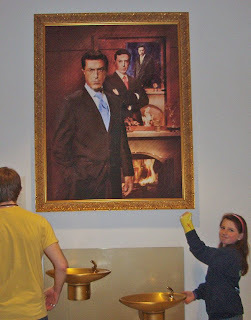 Because she watches the occasional Colbert Report, she knew his portrait would be hanging near the bathroom in the National Portrait Gallery while we were there. So we added the Gallery to our itinerary and took a photo of her showing her Wrist Strong (her wrist was anything but – it was broken) with Stephen’s portrait. Once again, TV came to life. When Colbert broke his wrist, he founded Wrist Strong! We salute him! So what does this all mean? That my kid watches too much television? No, she really doesn’t but her mom is a current events junkie. What I think it does mean for today’s youth, the gap between what they see on television and what is real is much smaller. They might actually put TV more in perspective than what it was when I grew up. That interaction is an important component of their media experience – be it online or in person – and they believe they have the power to question, interpret and participate. I bet these kinds of things are happening in your house too. Pay attention. See what you notice. And then please, share your stories.